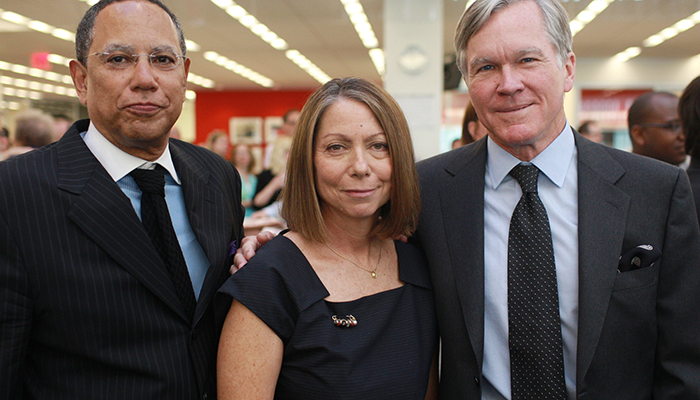 The backstory of Jill Abramson's firing from the New York Times deserves to be told in full. There are lessons learned for present and future managers to avoid this morale and p.r. debacle for the next time. I don't know Abramson although I have briefly met Bill Keller, Dean Baquet and Arthur Sulzburger during my time in Washington. And I don't know the specific newsroom culture at the Times, but I have some knowledge of how newsrooms ought to work. The Times can be and should be - an inspiring work environment. But like all alpha news organizations, apparently, a tough place as well. At a social gathering in DC, my wife (a voracious Times reader) observed to a Times reporter, "It must be a great place to work." To which he replied, "You obviously don't work there." At their best, newsroom cultures can be similar to one another in that they are often inspiring, competitive and highly-charged. As someone once observed about the newsroom where he worked, "you can't buy that level of adrenalin on the street..."
But the downside of newsroom culture is that it can be deeply obsessive, powerfully competitive and very macho. Bullying occurs. It's a lot like high school with the cool kids running the show. If you are young and female, there can be a lot of sexual tension, even predatory behaviour. Often successful women in news organizations assume a lot of those so-called male qualities. Abramson found out just how tough a place it was and probably always will be. News organizations like the New York Times, NPR or the CBC are seen to be pinnacles of journalistic ambition. When gaffes occur, they quickly become public. Journalists defend their turf through tough infighting, and employ any tactic that might lead to an advantage. (Quoth one wag: "A good day in a newsroom is when you get stabbed in the front..."). When that happens, newsroom pirañas start to circle the wounded. Gossip (the stock in trade of journalists everywhere) exacerbates weakness by anticipating impending failure and possible job vacancies/opportunities. If a high-profile newsroom journalist or manager makes a gaffe or a misstep with upper management, the smell of blood in the water is powerful. Ambitious journalists who have a keen eye for when something is out of sync, know it instinctively. When that happens, it's almost impossible for that person to recover his or her once lofty and previously unassailable position. That's what appears to have occurred at the Times.